Last minute Father's Day shoppers don't fret! If you are looking for something useful and practical to give the special man in your life why not give him the gift of clean teeth with new Philips Sonicare DiamondClean Black Edition electric tooth brush! Hubby has been looking for an upgrade to his current tooth brush and I have a feeling this one won't disappoint. When it comes to brushing your teeth, a toothbrush is not just a toothbrush with Philips Sonicare. The Philips Sonicare DiamondClean Black Edition is the ultimate accessory for the man's bathroom. Not only does it have a sleek, new design with 5 brushing modes and a dual charger like you've never seen but it also has great health benefits like whiter and healthier looking teeth! Great addition to your man's bathroom accessories. Removes up to 7X more plaque than a manual brush. Improved gum health in only 2 weeks. Whitens teeth 2X better than a manual brush. Range of 5 modes including gentle cleaning with sensitive mode. Sonicare dynamic cleaning action drives fluid through the teeth which disrupts plaque and bacteria where bristles can't reach. Use with Sonicare DiamondClean head for best whitening. Quadpacer intervale timer encourages thorough brushing. Two-minute timer ensures recommended brushing time. Up to 3 weeks brushing time with one charge. Unlike other electric brushes which use a simple power base, the Philips Sonicare DiamondClean has dual charging methods - you can charge by placing it in the included charging glass (which also doubles to rinse your mouth when brushing!) or use the USB ready charging case to keep your brush at its strongest on the go! 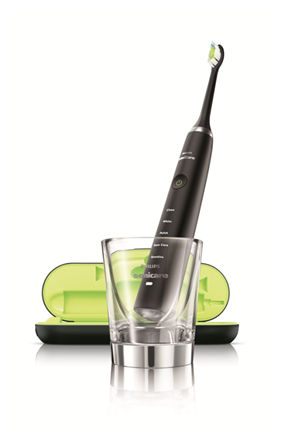 Philips Sonicare DiamondClean Black Edition can be purchased at Shoppers Drug Mart, Target and London Drugs for $229.99. For more information about this and other Philips products please visit the Philips website! Posted on behalf of Philips. Complimentary product in exchange for review. Opinions and comments on this blog are always my own. BIC Kids - Teaching kids to write, the right way! Mastermind Toys Celebrates 3rd Ottawa location! SmarTrike for her first bike! Stay safe from the sun with SwimZip! Save on the everyday with #AmazoncaSnS! Give Dad the Original Stitch this Father's Day! It's tick season. Is your pet protected?